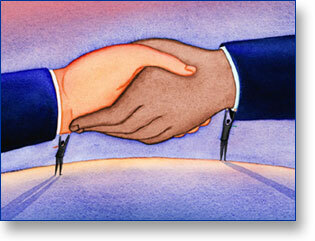 Business Networking To Attract Clients: Finding a networking group & strategy. Effective networking is the foundation of successful small business marketing for service professionals. Use this guide to make better use of your time and increase your business opportunities. Get connected with prospects and people who know members of your target market. Use the directory of networking groups to build your list of contacts and to increase your opportunities and increase profits. Use the links on the left of this page to explore the sections of the business networking directory. College is a common bond (4 years of shared academic, social and dining experience) that can help you build your network. Contact your alumni association for a list of alumni. Most colleges share names and addresses as well as job information. Depending on your business, getting to know folks in your geographic area can be fun and profitable. Use these lists to find national and local groups that will help you meet others interested in growing their networks. Some of these groups let you search their online database to contact other members beyond those you’ll talk to at local monthly meetings. Use this listing to find networking groups organized by gender, religion, race or ethnicity. If you have a particular company or individual in mind that you’d like to connect with, these tools will help you find background information on companies and individuals. Learn the 7 Secrets of Effective Networking to make better use of your time and create a steady stream of referrals.